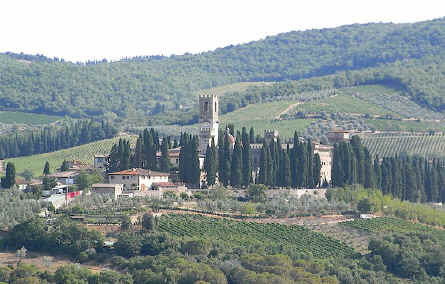 Vacation rentals and holiday homes in the region of Tuscany. 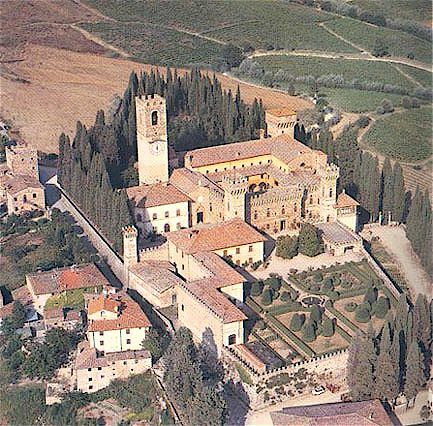 The Monastery of Badia a Passignano, founded by Sichelmo in 890 at Badia a Passignano in the Chianti Classico wine zone. Badia a Passignano was founded on an isolated site reachable via a branch of the road known in mediaeval times as the "strada senese del Sambuco", the route to Siena preferred by the Florentines until at least the year 1200. The Abbey, founded in 1049 as a consequence of the Vallombrosan monastic reforms, takes the form of a quadrangular fortified monastic complex with corner towers. Towards the middle of the 15 C the convent was augmented by the addition of cloisters and a wall. The principal structures open onto the courtyard, which is reached by passing along an avenue of cypresses. Among these is the Church of Saint Michael Archangel, which probably dates back to the 13 C, based on the facade which is covered in "filaretti di albarese", and the bell tower, both of which are unfortunately much restored. The crypt of the church, roofed by cross vaulting resting on four columns with simple capitals derives, in contrast, from a preceding Romanesque structure. The church possesses a unique nave in the form of a latin cross. 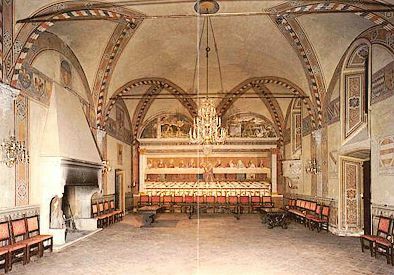 It was reconstructed in the second half of the 16 C and then once again at the start of the 18 C and in the middle of the 19 C. The wooden partition that divides the church dates from 1549 and is the work of the vallumbrosan convert Michele Confetto, who also carved the wooden choir with inscriptions in Greek and Hebrew. Badia a Passignano, in fact, was also a centre of oriental language studies. The sacristy dates from the second half of the 16 C.
The entrance doorway to the monastery is located in front of the church. The monastery is occupied by a tiny community of vallombrosan monks, and may be visited upon request Sunday afternoons when a guide is made available. From the main doorway, one enters a small square characterised by two towers and a mediaevalised prospect resulting from reconstruction after 1870 when the complex became private property. The stone entrance, in contrast, is original and dates from the 15 C. The refectory, the kitchen and the chapter's room, which opens onto the cloister, the may be visited. Outside the walls of the complex is the little village of Borgo di Passignano with a 12 C tower house and the church of San Biagio (open only on the feast day of the Saint). 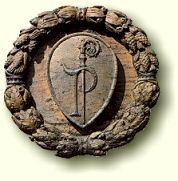 The Badia a Coltibuono near Gaiole in Chianti slso belonged to the Valombrosan Benedictines for several centuries before being converted into a fortified villa-farmhouse under the patronage of Lorenzo dei Medici in the 15 C.